What does a delivery button do? Delivery buttons were designed with delivery people in mind. You can either configure your button to find and specifically notify the recipient of each and every package, or the Delivery button can notify your pre-set list of x designated package handlers. Finally, who should be notified when a delivery arrives? You’ll see options on the left to turn on or off contact selection. 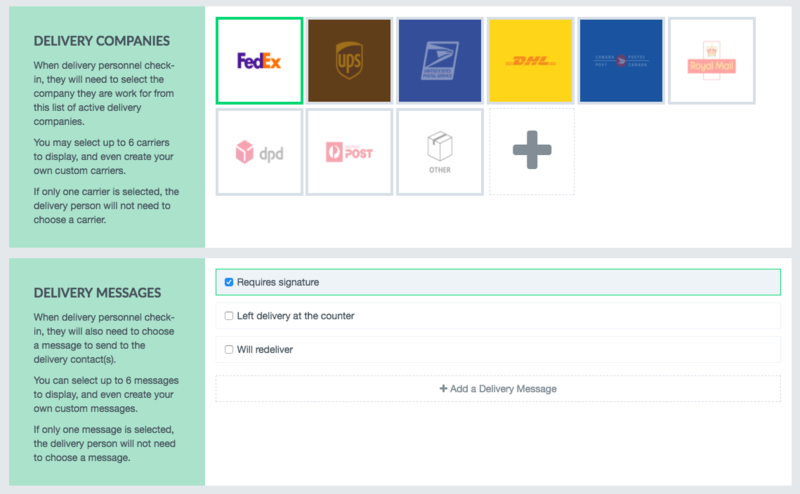 With contact selection OFF, all of your selected contacts will automatically be notified when a delivery checks in; delivery personnel will NOT be asked to select the recipient of their delivery. With contact selection ON delivery personnel will be able to see, select, and notify the specific recipient of their delivery. (This is great for food deliveries!) Remember, with contact selection ON you’ll need to also check off all of the contacts you want to allow deliveries to select from.